Wellness company, Flora, is my go to for the finest natural health products and herbal remedies. My probiotics, unrefined oils (Pumpkin, Olive, Omegas), Calcium/Magnesium, and more are all from Flora. I also drink their lauded Flor•Essence tea at night before bed – it’s an herbal remedy that helps flush the body of toxins. When I learned that Flora also makes a Flor•Essence face cream that’s made with many of the same herbs, I got giddy. Given the company’s supreme quality standards and controls and how good I feel after drinking the tea, I figured this cream must be a slam dunk, and it is – my skin is smooth, dewy and clear. Women seeking the best in non-invasive, anti-aging procedures head straight to this sumptuous LA based, celebrity frequented oasis in tony Larchmont Village. Overseen by board certified plastic surgeon, Dr. Glenn Vallecillos, MD, F.A.C.S., DMH also offers their own line of skin care designed to help turn back the clock. One of the stars in their collection is this lightweight serum that leaves my skin looking plump and smooth. I apply a couple of pumps in the morning on clean skin before my moisturizer and sunscreen, and any rosy areas just fade away. When seeking the height of skin care luxury it’s La Prairie that takes the cake. Their newest addition to the White Caviar collection is this cream designed with the “revolutionary patented molecule,” Lumidose – and what the company’s scientists call the most powerful brightening active. Even after wearing and reapplying sunscreen throughout the day, my skin tends to get blotchier in the summer, so I reach for this power player as part of my morning routine and it instantly brings back the luminosity. 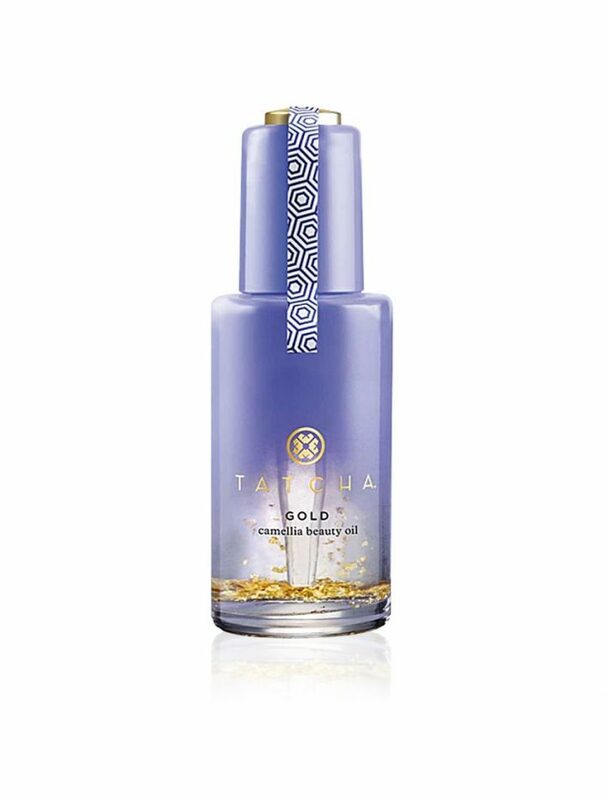 Created by celebrity makeup artist, Lina Hanson, this heavenly, healing serum is part of her all natural skin care collection featuring pure ingredients sources from around the world including Marula Oil from South Africa and Matcha Tea from Japan. When my skin needs an added dose of hydration or just an extra boost (that little something, something! ), this does the trick. And, like the Ecologica Curative Formula above, it has a beautiful, clean scent, melts right into skin and leaves a fresh, supple glow. Talk about one stop shopping – this single cream does it all. Created for all skin types and addressing every part of the face (including neck, décolleté and eyes), it’s ideal for those who crave low maintenance, yet powerful skin routines, and of course a must have for frequent travelers. Created by a titan of the beauty industry who has been behind the formulations of some of the most prized luxury skin care lines — biochemist, Mirela Mitan, PhD. This wonder cream, formulated with a proprietary blend of fermented white truffle, hyaluronic acid and pure olive extract, promises to pretty much do it all – hydrate, reduce fine lines, even skin tone, and rejuvenate skin, so if you just use this and nothing else you’re covering all bases. The scent is lovely and subtle, and my skin looks brighter and more even after using it. Vicki Cooper of Faces by Vicki is the resident Malibu skin care expert whose client list reads like the red carpet arrivals line at the Oscars. 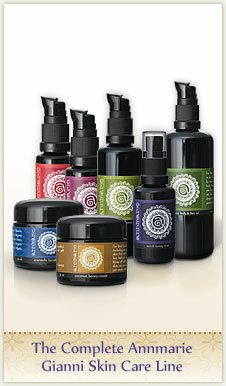 Her line of products she meticulously developed, Ecologica, is both highly natural and incredibly effective. One of my favorites is this magical, 100% natural concoction that smells like heaven and has a soothing seaweed base plus hyaluronic acid. 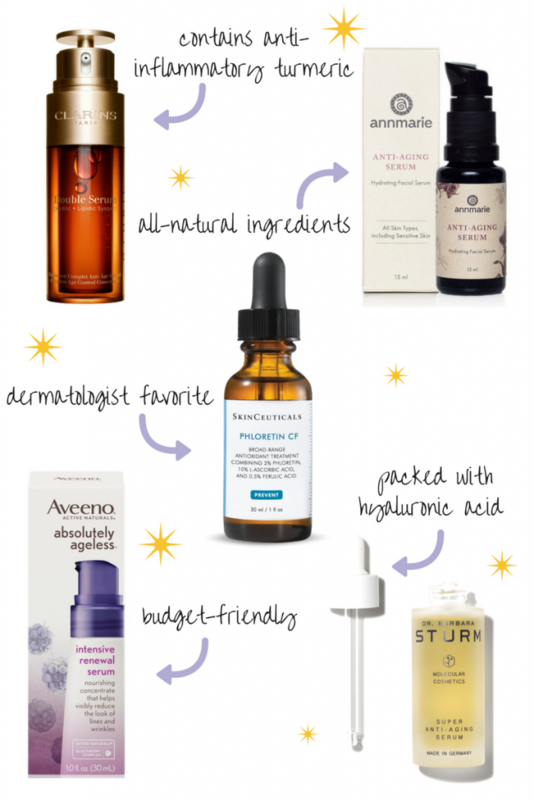 I use it in a variety of ways – pat a few drops into my skin as a final step after moisturizer, cocktail (i.e. mix) a bit of it with Vicki’s Regenerative Cream, and I also love to press it into my skin straight up on its own. I even use it as an all over moisturizer on my hands, elbows and legs. It sinks right into skin without an ounce of greasy residue and leaves a coveted glow (along with that completely pure, alluring scent). Milk by K. Hall Designs: An intoxicating mix of cream, vanilla and coconut. What more can I say!? 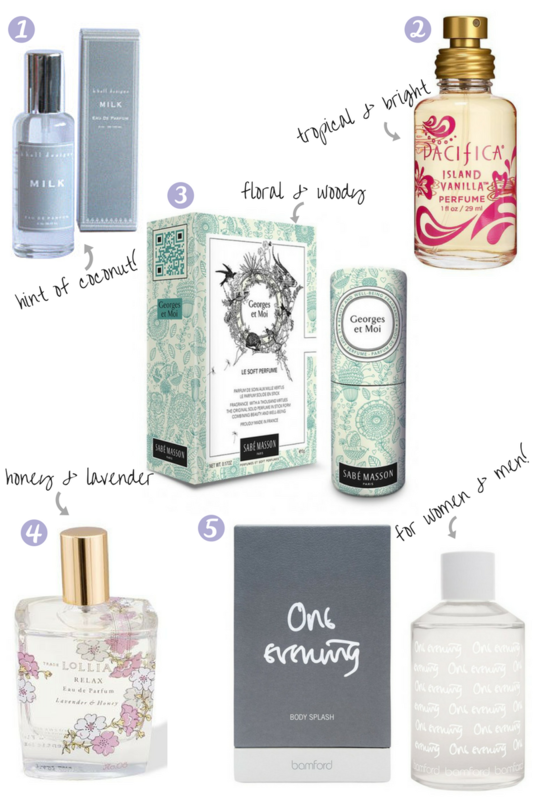 Island Vanilla by Pacifica: Who doesn’t appreciate a vanilla fragrance? This one kicks it up a few major notches with nuances of fruits, tea and honey-jasmine – a delightful spin on a classic. Georges et Moi by Sabe Masson: A mesmerizing floral-woody scent with bergamot, rose and vetiver from a perfumery in France. You’ll fall in love with the portable design… it looks like a lip balm and is made with natural, skin moisturizing ingredients like mango butter. Easily dab some on; especially ideal when you’re on the go. (The link I included takes you to the French based company website. The U.S. price is around $25). Relax by Lollia: This soft, magical blend of lavender and honey is irresistible. One Evening by Bamford: Unisex fragrances are hotter than ever and this one’s a slam dunk with notes of vetiver, cedar and amberwood, from the UK based body, skincare and clothing company. 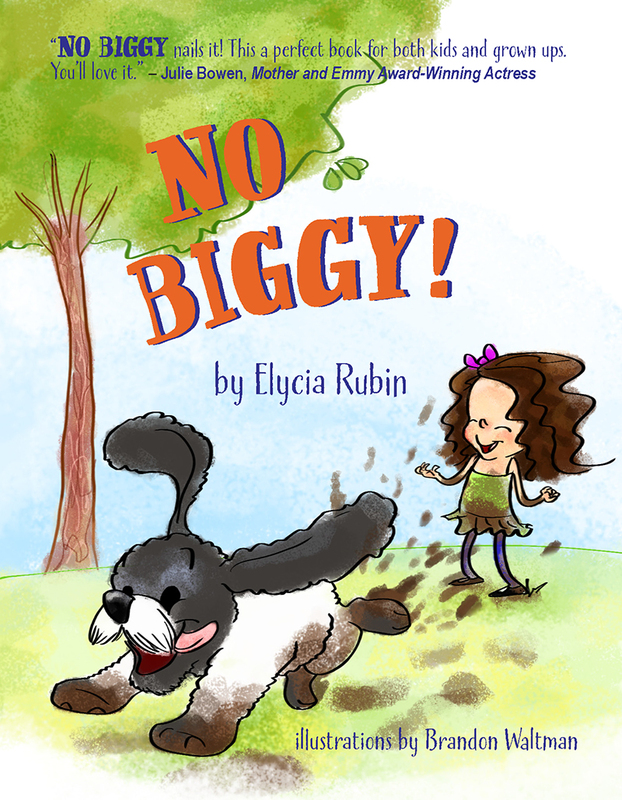 (It’s referred to as a body splash but I can attest… it has great staying power). 1) Annmarie Gianni Aloe Herb Cleanser – I can’t tell you how much I love Annmarie Gianni’s skin care products. They’re completely natural, they smell clean and delicious, the prices are fair, and bottom line, they work! The products are also housed in glass containers which is best for safe preservation of these precious fluids. The creamy Aloe Herb Cleanser is for all skin types, it washes off easily and leaves my skin feeling soft and dewy. A few times a week I also use Annmarie Gianni’s other cleanser, Citrus Mint for oily and acne prone skin – I tend to get a little oily around my nose and chin and this stuff does the trick. I never need to use another cleanser again – these two are it for me! 2) SkinCeuticals Phloretin CF – This anti-aging serum has been part of my arsenal for the last five years and I swear by it. I use it religiously every morning right after washing my face. It’s pricy but a little goes a long way and I believe this is a very effective serum. I’m not a scientist or doctor; I just know what works really, really well for my skin. So, go ahead and read about the science behind this stuff here. It melts right in and fine lines seem to disappear. 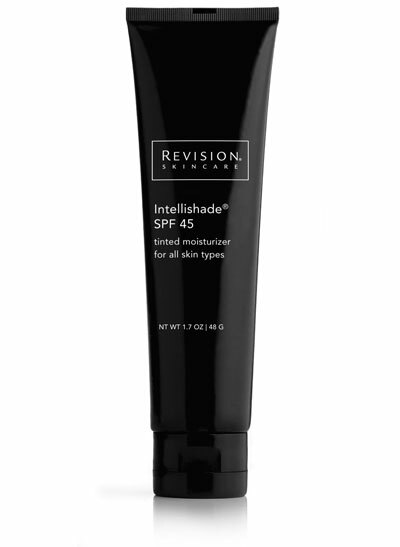 3) Revision Moisturizing Anti-Aging Sunscreen – I love me a three-in-one beauty product and Intellishade Matte by Revision is the holy grail – an anti-aging tinted moisturizer with sunscreen (SPF 45). I was never into tinted moisturizer until I discovered this stuff. It goes on smooth, sinks right in, never feels tacky, and helps my skin look flawless. It’s a lifesaver when you want to go makeup-less or just don’t have time in the morning for anything more than a slathering. 1) Annmarie Gianni Cleanser – Either Aloe Herb (all types) or Citrus Mint (oily or acne prone). 2) Annmarie Gianni Herbal Oil – Pure oil for your skin? Yup! Greasy? Not at all! I use the Herbal Oil for oily/acne prone skin every night, especially all over my forehead and dab it around my nose and chin. Before using this magic elixir I used to get bumps all over my forehead and they’d never seem to completely go away. After a few days of using it those bumps have never returned. Annmarie makes an Herbal Oil for normal/combination skin too, which I use here and there, especially when my skin feels dry. So to boil it down, I’ll use the Herbal Oil for oily skin on my forehead, chin and nose and the Herbal Oil for Normal and Combination Skin where my skin tends to feel dry (cheeks) and other areas that need a little extra moisture (neck and chest). 3) Annmarie Gianni Anti Aging Oil – I add this oil into the mix since it’s got the extra oomph of anti-aging. Mostly I use it around my eyes, forehead and lips. Love it. 1) Annmarie Gianni Dead Sea Scrub – Two to three times a week I use this ultra fine scrub after the cleanser and it works like a charm. You’ll see the results right away – smooth, baby soft skin. 2) Erno Laszlo Transphuse Age-Defying Mask – This one immediately had me at Age-Defying! I spread it all over my face and neck and keep it on for 15-20 minutes. It’s very creamy and feels like a moisturizer. Sometimes I even leave it on overnight and wash it off the next morning. It leaves my skin looking smooth and line-free. Yes, it’s on the pricier side but I think it’s well worth the splurge considering it lasts awhile and I can see visible results after using it. And, there you have it! Everyone’s skin is different of course. I’m simply laying out what really and truly works for me. It’s a pretty quick and simple regime too. Once you dive in, I’d love to hear your feedback. 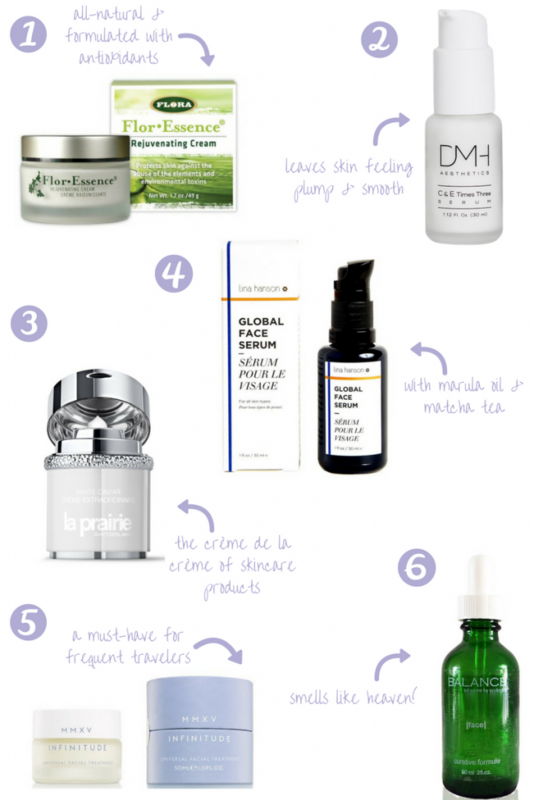 Cheers to gorgeous, glowing, healthy, covet-worthy skin!